Lot 147. 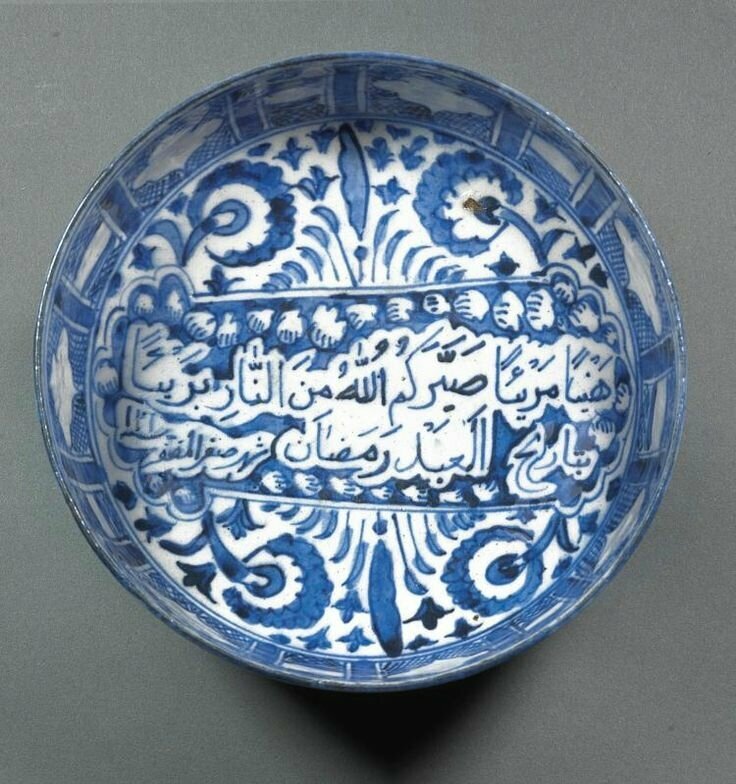 A rare Safavid blue and white bowl, signed by Ramadan, Persia, probably Mashhad, dated 1121 AH/1709 AD. Estimate 10,000 — 15,000 GBP. Lot sold 21,250 GBP. © Sotheby's. 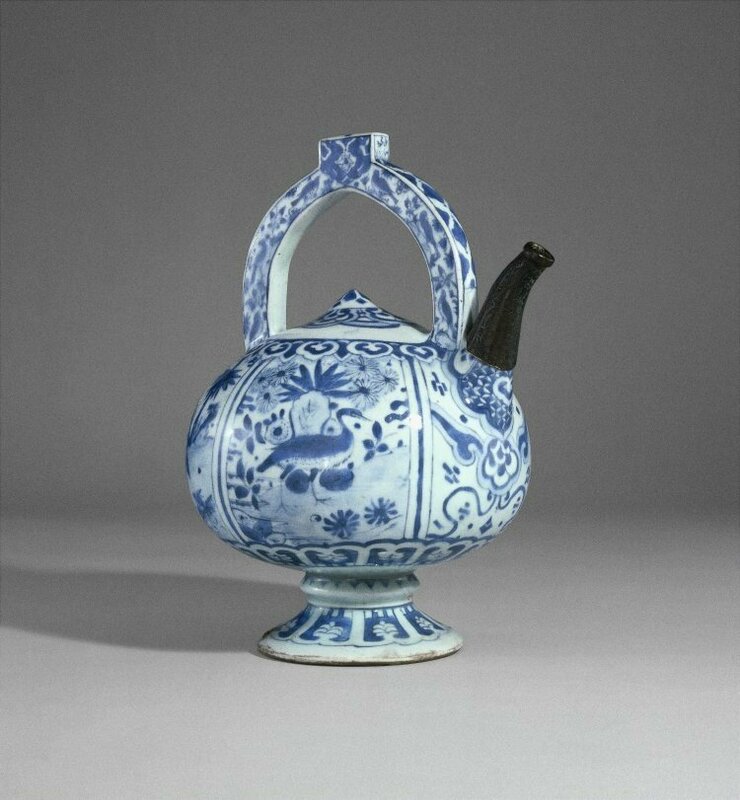 white fritware body with deep central bowl and tall vertical edges on short foot ring, underglaze cobalt blue decoration with central inscription and floral stems, exterior also with inscriptive band; 8.8cm. height; 20.1cm. max diam. Provenance: K. R. Malcolm, C.B.E (1908-84), thence by descent. Bibliography: G. Fehérvári, 'An early eighteenth-century Persian blue and white', Journal of the Royal Asiatic Society, 1970, Hertford, pp.137-141. An offprint of this article, which is devoted to this bowl, is included with this lot. ‘Enjoy it with right good cheer. May God keep you from the fire [of hell] unaffected! The crosscurrents of Persian and Chinese ceramic wares can be traced back to as early as the ninth century, both through trade and artistic motifs. 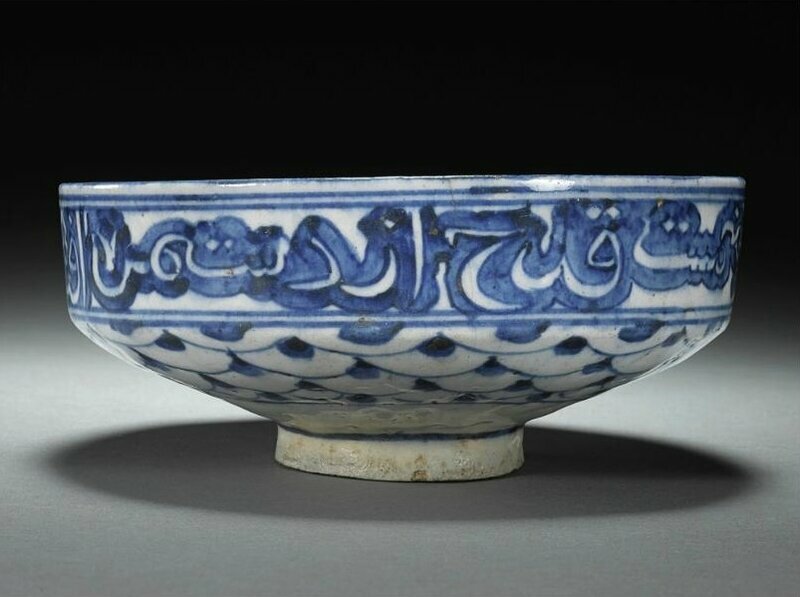 This bowl, while referencing the Chinese blue-and-white wares from which it is derived, also provides an impressive and unique model of developments in Persian design, highlighted by its rarity as it is one of only three known examples of this style to be signed and dated. The exterior Persian inscription is offset by the central Arabic inscription which reads “Enjoy it with right good cheer. May God keep you from the fire [of hell] unaffected!” This is followed by a signature of the artist “The slave Ramadan” and the date “Safar 121.” It is likely that the first digit has been omitted rendering the date of the bowl Safar 1121 AH/April 1709 AD. Dated examples of Persian blue-and-white ceramics are extremely rare, and those dated and signed even more so. 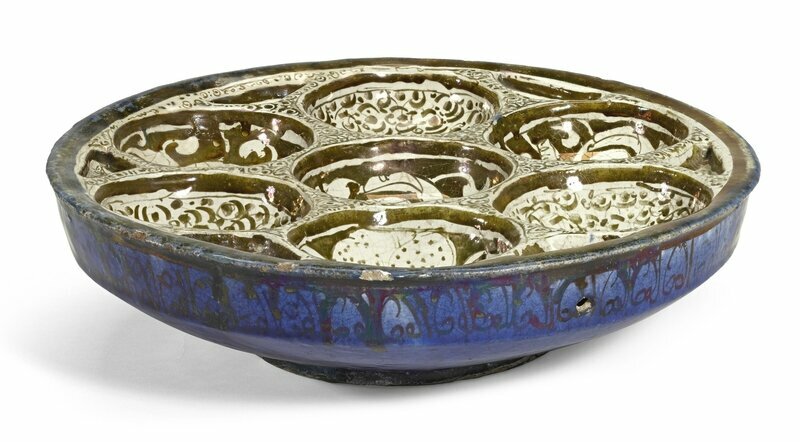 According to Fehérvári’s survey of dated Persian blue-and-white wares, this bowl is one of only three that are both signed and dated. The other two examples comprise a teapot in the British Museum, London (inv. no.1902,0521.1) and a bowl in the same collection published in R. L. Hobson, A guide to the Islamic pottery of the Near East, London, 1932, fig.86 (Fehérvári 1970, p.140-1.) While little is known about the artist, the stylistic elements of this bowl speak volumes of the decorative repertoire of Persian craftsmen in the Safavid era. Pouring vessel, 1616-1617 (AH 1027), SE Iran, perhaps Kirman, Mashhad, filled from the top of the handle, decorated in underglaze blue after contemporary Chinese export wares (Kraak porcelain). Inscribed at the top 'The work of Mahmud Mi'mar-i Yazdi, decorated by the craftsman Zari' with the date 1025/1616-17. The metal spout is a 19th century addition. Height: 24.8 cm, Diameter: 18 cm; inv. no.1902,0521.1 © 2017 Trustees of the British Museum. The finely potted white body under a brilliant white glaze sets off the striking floral and foliage design in cobalt blue which is defined by a darker blue outline. The free-flowing, luscious flower forms are distinctly Persian in style and contrast with the precision characteristic of Chinese Kraak wares. 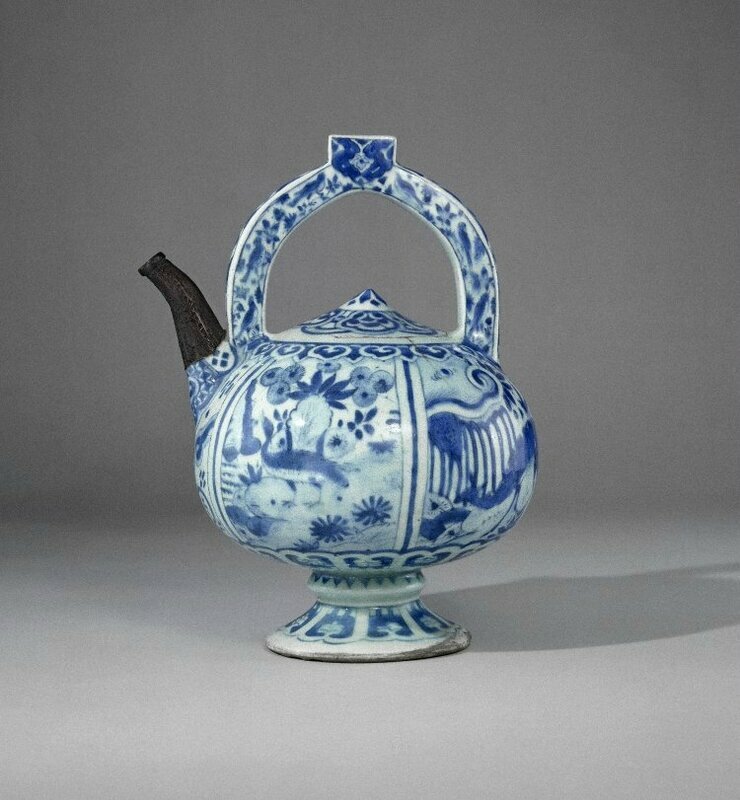 The result is a dynamic variant of its Chinese counterpart, which is heightened by the fine balance of the overall composition of the bowl. A similar floral design adorns a bottle and a jug currently in the Victoria and Albert Museum collection (Crowe 2002, p.270, no.490 and p.273, no.497). Vertical blue and white lines divide the inside shoulder of the bowl into fourteen panels of square and rectangular form, containing alternating elongated medallions and oval forms. Such panels evoke a simplified form of the Kraak “petal panels” discussed in Crowe 2002, pp.61-66. 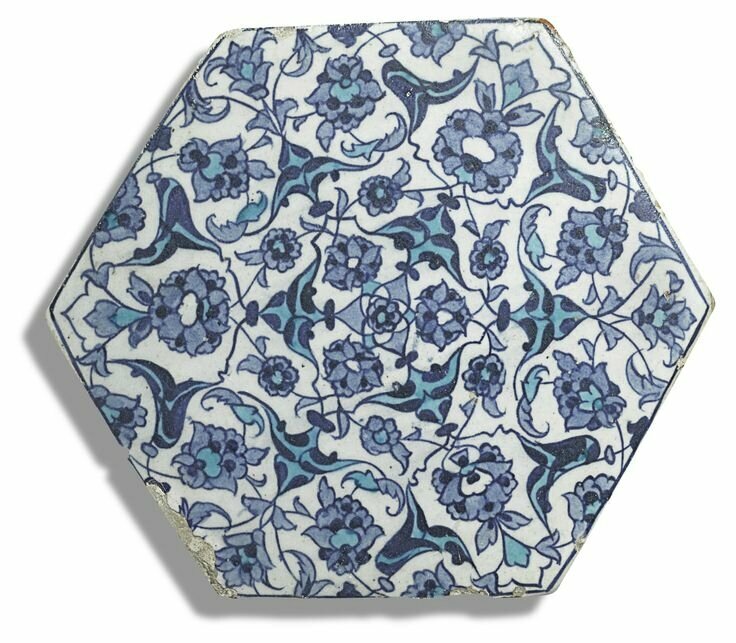 The hatching that shades these panels recalls a common motif in earlier Timurid ceramics and resembles the pattern on a bowl sold in these rooms on 5 April 2006, lot 97. Furthermore, its deep conical shape on a slightly flaring foot echoes the lustre-wares of Kashan as early as the late twelfth or early thirteenth century (Fehérvári 1970, p.139), illustrating the pervading influence of earlier Persian works. 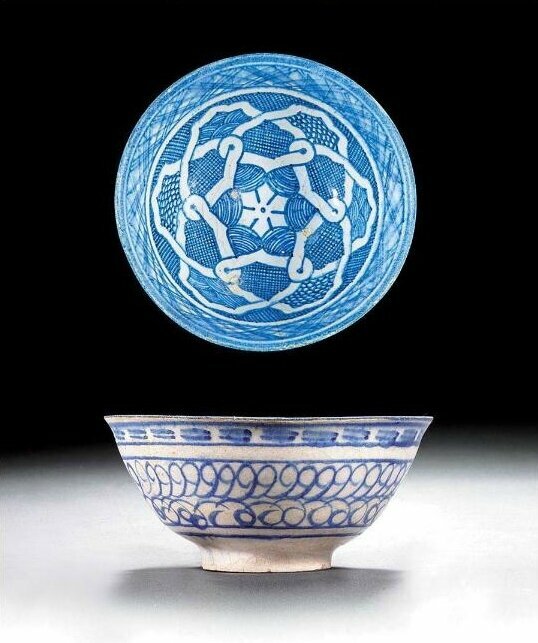 A small Timurid blue and white bowl, Persia, 15th century, 14cm. diam. Sold for 6,000 GBP at Sotheby's London, 5 April 2006, lot 97. © Sotheby's. Forming an intermediary between Chinese and Persian design is the scale-like pattern decorating the underside of the vessel. One such example in Chinese ware is currently in the Sadberk Hanim Museum, Istanbul (Carswell 1995 p.67, fig.66), yet there are many Persian examples that highlight the various forms of the motif (see Crowe 2002, p.219, no.380: Lane 1957, pl.78A). This design hints at the potential production site of the bowl, since it adorns certain works created in seventeenth century Mashhad (see Lane 1957, pls.77A & 78A) and Fehérvári attributes, therefore, this vessel to the same centre (1970, p.139).